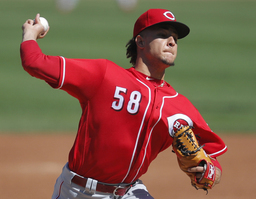 GOODYEAR, Ariz. (AP) Luis Castillo has been picked to start on opening day for the Cincinnati Reds. Rookie manager David Bell made the announcement Tuesday, saying Castillo will get the ball March 28 at home against the Pittsburgh Pirates. Castillo was 10-12 with a 4.30 ERA in 31 starts for the last-place Reds a year ago. The 26-year-old right-hander is set to begin his second full season with Cincinnati. Castillo broke into the big leagues straight from Double-A Pensacola on June 23, 2017. He made his first start against Washington five months after the Reds acquired him and Austin Brice from the Miami Marlins in a trade for Dan Straily. Cincinnati traded for three experienced starters this offseason: Sonny Gray, Tanner Roark and Alex Wood. Castillo and Anthony DeSclafani are the only holdovers from the 2018 rotation. Bell said Gray, Roark and DeSclafani will follow Castillo. "It was fun telling him. He was excited about it," Bell said. "He's had a lot of success leading up to now. We like the progress he's made in spring training. We think he's in a good place to start opening day. We trust any of those four guys." The Reds have yet to name a fifth starter to fill in for Wood, who is recovering from pain in his lower back. Castillo has made four appearances this spring, including two starts, and allowed 12 runs in 7 2/3 innings. He pitched four innings in his last start Sunday against Cleveland, yielding three runs and four hits.